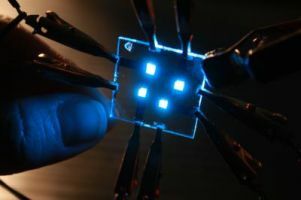 Researchers from the University of Michigan developed an efficient fluorescent blue OLED. The ceiling for the efficiency of such OLEDs was believe to be around 5%, and the new OLEDs are close to 10%. The new material is a computer-simulations assisted redesign of a current material used by the University collaborators in Singapore. If you're interested in the science behind the story, you can access the original paper for free via MaterialsViews.com.